Full disclosure, I've asked a very similar question before which didn't have much success as it was too specific. However I want to try again by restricting the scope of the question. The output/input impedances in the above schematic come from the DAQ datasheet. Fitting an RC model to the measurements I find the capacitance to be around 57 pF (1396 Hz 3 dB point). This then fits quite well to the measurements, up to about 10 kHz. 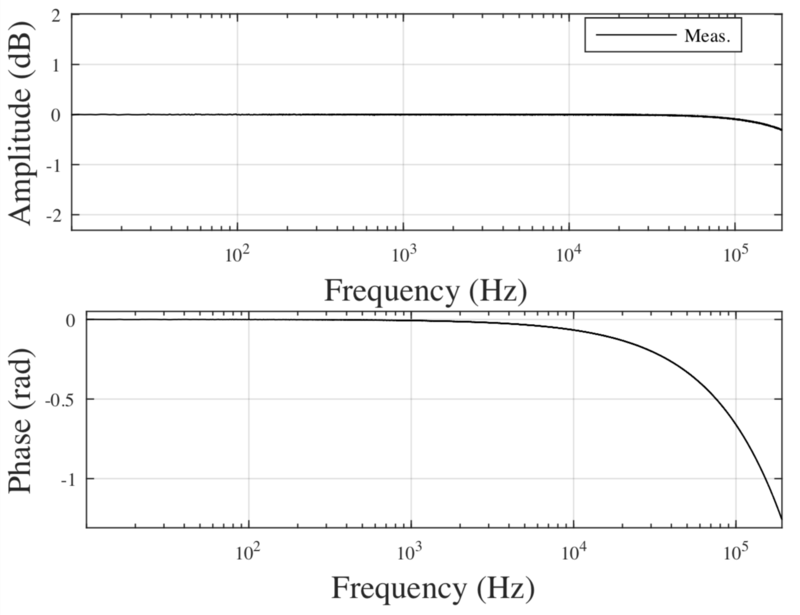 Why at high frequencies do the measurements deviate from the model? Has anyone seen this behaviour before? Below is the measurement with no R2, i.e. no 2 M resistor. There still seems to be a deviation in amplitude and phase from the anticipated flat response. 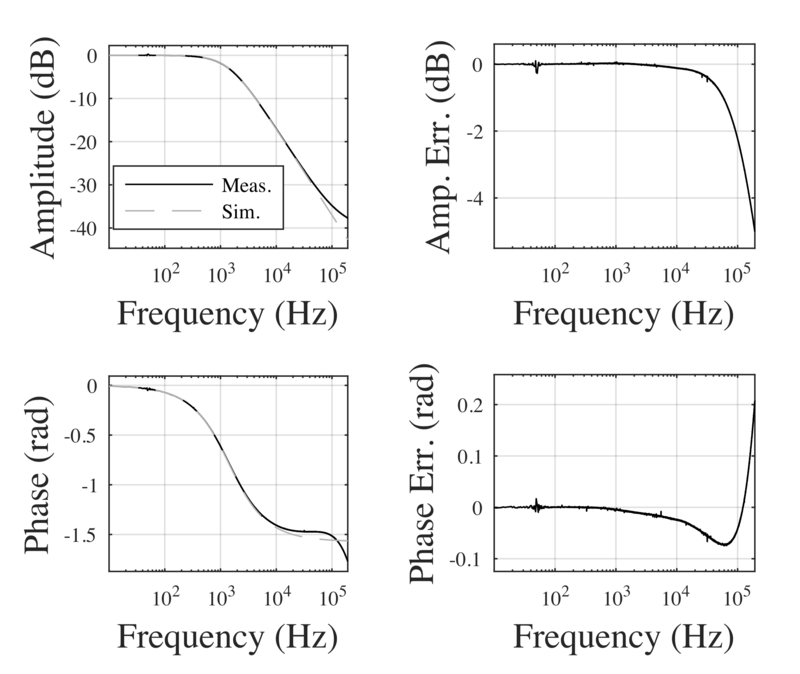 The amplitude response fits what is specified in the datasheet in Figure 2. For reference, I'm using a sample rate of 1 MHz, am using a signal length of 1 second which is averaged 100 times. Simulate a parasitic capacitance (say 0.1pF or 0.5pF) in parallel with your 2M resistor and see what happens. First of all, thank you for asking such a specific question. I see a lot of questions here that are just homework related. I am not sure but I think this systematic error is because of high frequency coupling. Your 2M source impedance is so big that the source to the input of the DAC is very weak. Radio waves tend to couple better with higher frequency. 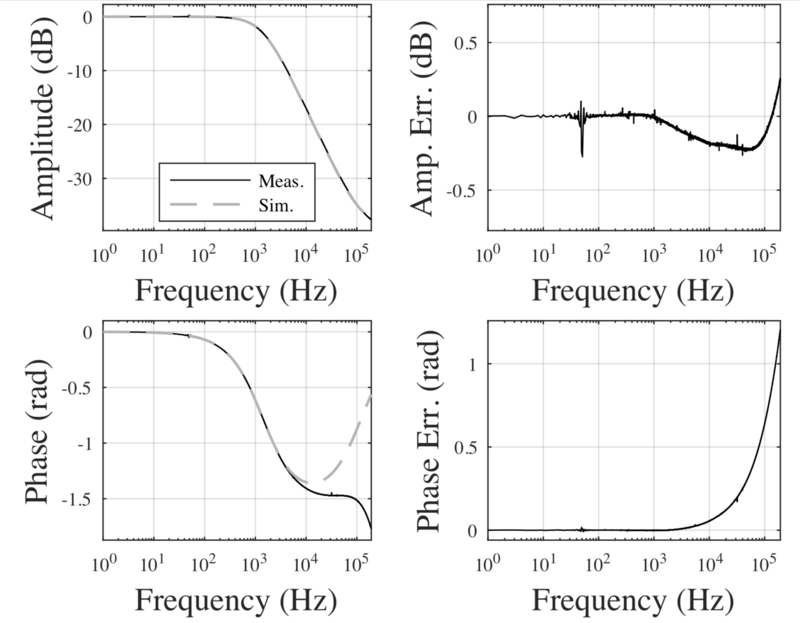 That‘s what I see from your figures: In real, you measure more signal amplitude with higher frequency than simulated. Not the answer you're looking for? Browse other questions tagged measurement transfer-function error or ask your own question.